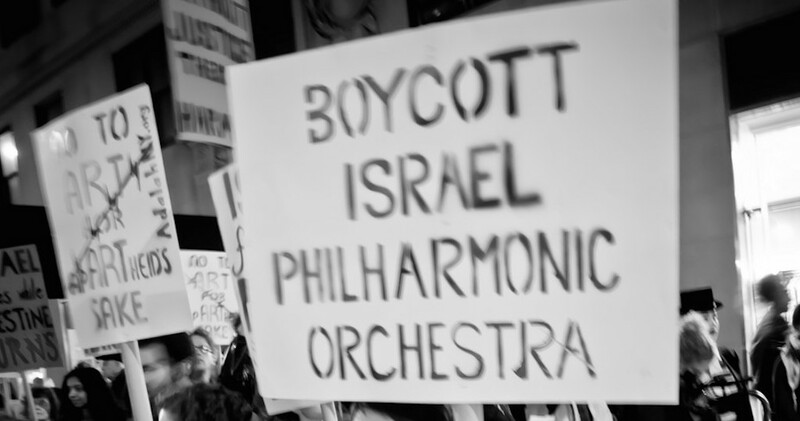 We write to urge you to cancel your participation in the First International Music Education Conference of the Israel Philharmonic Orchestra (IPO), sponsored by Israel’s Ministry of Foreign Affairs (MFA) and scheduled for May 14-17 in Tel Aviv. We appeal to you to respect our collective non-violent effort to hold Israel accountable, and to deny the Israeli government an opportunity to use your good name to mask it’s occupation, colonisation and apartheid policies. The IPO is not an apolitical cultural institution; it plays a public role in the official Israeli propaganda campaign titled Brand Israel, which uses music to distract from Israel’s military occupation and human rights abuses. Furthermore, the IPO’s involvement in Israel’s militarism is well-documented. In 1948 during the Nakba, or catastrophe, when 750,000 Palestinians were expelled from their homes by armed militias and later Israeli soldiers, the IPO “traveled in armored cars … raising the morale of civilians and soldiers alike.” In 1967, as Israel occupied the West Bank and Gaza, “Zubin Mehta arrived in a plane full of ammunition from Europe.” IPO’s website further notes that during the 1967 war, “the Orchestra continued to perform before IDF soldiers from the Golan Heights to Sinai.” The Orchestra also proudly announced its partnership with the Israeli army in a program where special concerts for Israeli soldiers are organized at their army outposts. From closing down Palestinian cinemas, to banning cultural and educational events, and preventing Palestinian artists from traveling, Israel’s attacks on Palestinian art and culture are too many to list. The IPO has not distanced itself from Brand Israel efforts, or official Israeli policies in any way. It is also consistently silent on Israel’s attacks on Palestinians, including cultural workers and organizations, and continues in its role as an ambassador for Israel, whitewashing its crimes and effectively giving a greenlight for these oppressive policies to continue. The 69th anniversary of the Nakba coincides with the date of this conference. This date is also when the IPO entertained Israeli soldiers who destroyed Palestinian towns and villages to ensure Palestinians could not return to them. On this anniversary, we truly hope that you will do what artists did in South Africa’s apartheid era: refuse to lend your name to apartheid.